AFFINESSENCE has selected three Natural Essences of CEDAR (Moroccan Atlas, Texas and Virginia) and blended them with precision to enhance the vibrancy of the most precious and refined Natural ingredient: Pallida IRIS or Florentine Iris Absolute. A drop of Benzoin and a dash of Myrrh mellow and soften this woody-powdery base with their tender caress, while Gaiac Wood, bolstered by Incense, turns its natural restlessness into an almost electric energy. This is a fragrance that will stir the senses to their very depths with its breathtaking fusion of sophisticated, intensely lingering scent and Musky sensitivity. Eau de parfum, 100 ml natural spray. 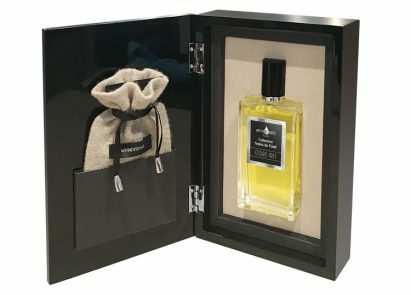 With a heavy zamac cap signed AFFINESSENCE and its precious cahsmere pouch to perfume, this eau de parfum is presented in a luxurious black-lacquered wood coffret, with magnetic closure, and a wrapped cardboard box.